Echigoya has been selling fine custom-crafted kimonos since 1755. 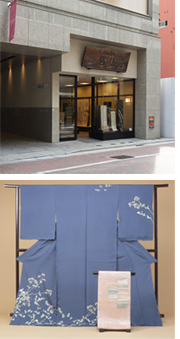 The main material used in kimonos and obi sashes is silk, but cotton, linen and even paper are also used. Selecting only the finest fabric and thread, every kimono we sell is custom fitted and meticulously sewn by craftsmen in Tokyo, Kyoto and other parts of Japan. We preserve a deep respect for the traditional designs and color schemes handed down from long ago, and offer a wide selection of items, from kimonos for parties and other brightly colored occasions, to modern creations sporting a Western touch. The kimono is the jewel of traditional Japanese craftsmanship. If you are in the neighborhood you must stop by and visit our showroom.